A Malaysian court ruled yesterday that the trial of two women implicated in the assassination of Kim Jong-un’s estranged half-brother, Kim Jong-nam, should continue. 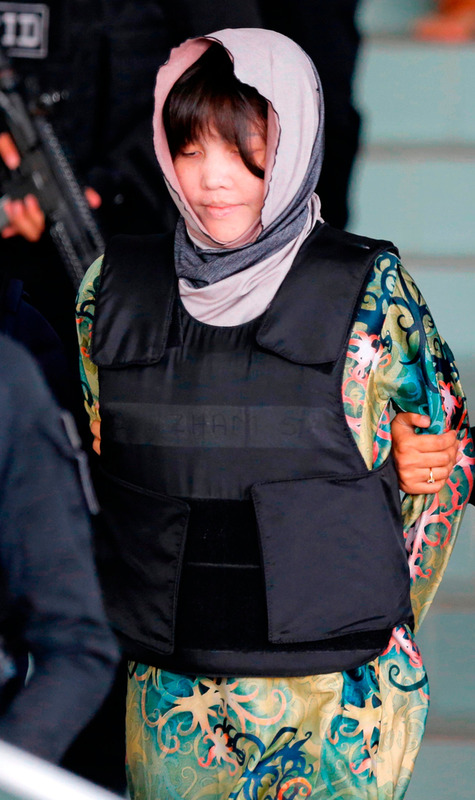 Indonesian Siti Aisyah (25) and Vietnamese suspect Doan Thi Huong (29) arrived separately at the Shah Alam court on the outskirts of the capital, Kuala Lumpur, shortly after 9am yesterday. Both wore headscarves and armoured vests as they were escorted by heavily armed guards. High Court Judge Azmi Ariffin said it could be inferred from evidence presented in court that there was a “well-planned conspiracy” between the two women and four North Korean suspects at large to kill Mr Kim (45) “systemically”. He called for them to enter their defence after reading his ruling for more than two hours. The defence phase of the trial is expected to run from November until February next year. The pair claim they were pawns in an elaborate politically motivated murder plot hatched by North Korean agents, and were duped into believing that they were actors in a prank TV show when they smeared lethal VX nerve agent, a chemical weapon, on Mr Kim’s face at Kuala Lumpur airport on February 13, 2017. “Though we are disappointed with the ruling, this is not the final ruling. We are still confident,” Hisyam Teh Poh Teik, Ms Huong’s lawyer, said shortly after the court announced its decision. He explained that the judge had found the contrast in his client’s facial expressions before and after the incident to be “suspicious” and wanted her to explain. “Doan has chosen to give evidence … her evidence will be co-examined and tested by the prosecution and we also informed the court that Doan has got witnesses from Vietnam to come and support her,” he said. The witnesses include government officials and police officers who interviewed two people key to the defence, but who may be too “afraid” to travel to the Malaysian trial, Mr Hisyam said. One was an ex-colleague who worked with Ms Huong in a Hanoi bar and who had introduced her to a North Korean looking for someone interested in working on short movies and video clips. The second was a freelance producer who had previously made prank videos in which she had played a role. However, describing the murder as something out of a James Bond movie, state prosecutors have maintained throughout the trial that the pair were well-trained assassins who knew exactly what they were doing. The prosecution made its closing arguments in June, based on testimony from 34 witnesses. “My gut is telling me the defence will be called,” the prosecutor, Wan Shaharuddin Wan Ladin, said before the decision was announced.